It’s Taco Tuesday y’all!! You remember the good ol’ days, right? When it was actually a weekly event? Yeah, me too. Vaguely. Do you miss it? Because I do! Truth be told, I’ve had a hard time finding new taco recipes that weren’t very similar to the many I’ve already made. Pinterest, you have failed me. I did, however come across a few newbs recently, so that bought us a few more Taco Tuesday posts coming up. This one seems to fit in with my ever-present liking of Thai flavors. I told J the other day, “Apparently I really like Thai flavors…” as I listed the dishes I’ve made recently with the word “Thai” in the title. But hey, I like what I like. There are worse things, right? I made a few changes to the recipe I found – mainly the amounts for the sauce and the toppings – and I’m really pleased with the turnout. Make sure not to overcook the chicken. Dry chicken is never a good thing. Never, ever, ever. Speaking of the variation in toppings…have you ever used broccoli slaw? I don’t think I ever have before, but I saw it at the grocery store and I thought it just looked like a good alternative to cole slaw for a taco topping. And when you mix it with a little rice wine vinegar…well, then it’s definitely a winner! 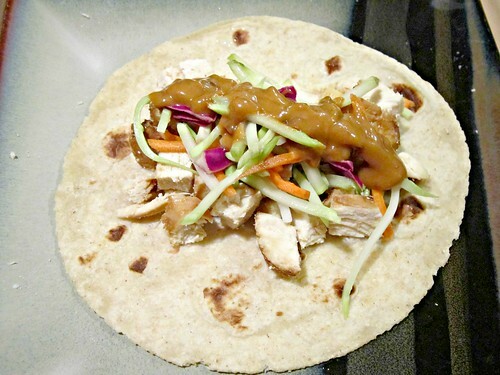 It has a nice flavor and crunch to it that is a nice contrast to the soft tortilla, chicken and deelicious peanut sauce. I increased the amounts of liquid in the peanut sauce because it just wasn’t as thin as I wanted it with the original amounts. But the flavor was insanely good. J always thinks it sounds weird to put peanut butter in a sauce or regular food or whatnot (he loves peanut butter though, in general), but he was a fan of this sauce for sure. And as an aside, the blog I found this on – Mountain Mama Cooks – does a Taco Tuesday event as well. I’m going to have to go back and peruse her archives for some new recipes! Combine the brown sugar, rice wine vinegar, tamari, fish sauce, sambal oelek, sriracha, ginger and garlic in a small bowl.Stir to combine. Place the chicken in a resealable plastic bag or a shallow dish and cover with the marinade. Turn to coat, cover and refrigerate overnight. Preheat oven to 425 degrees F and line a baking sheet with foil or parchment paper. Remove the chicken from the marinade and lace on the prepared baking sheet. Bake for 25 minutes, or until chicken is cooked through. Don’t overcook or it will be dry! Remove from oven and let cool slightly on a cutting board before cutting into bite-size pieces. Combine the broccoli slaw and rice wine vinegar in a medium bowl and refrigerate to let the vinegar absorb into the slaw while the chicken is cooking. Meanwhile, whisk together all of the ingredients for the peanut sauce, and set aside until ready to use. To assemble tacos, warm your tortillas and place a couple of spoonfuls of chicken in the center. Top with broccoli slaw and peanut sauce. Sorry. Shouted a bit there. OR you could begin going out to eat tacos, and posting about your local area…. Do. I'll hold you to it.